Simple Solutions that Work is an online teaching/solutions-oriented publication that is published twice yearly for the metal and die casting industries. 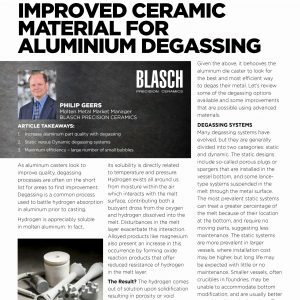 In the latest issue, Blasch Market Manager Phil Geers discusses ways to increase aluminum part quality with degassing and compares static versus dynamic degassing systems. Read this month’s issue for a closer look at Blasch Precision Ceramics and their foundation for success.